The bedroom has a queen sized bed. Caribou Highlands 542 is a 2 bedroom, 2 bathroom unit at the Caribou Highlands Resort. The living room is open to the dining room and kitchen area, which is perfect for the whole family to spend time together. The upgraded kitchen is located just off of the living room area. The attached master bathroom has a remodeled tile walk-in shower. The comfortable, open living area is a great place to hang out after a day of exploring the North Shore. The lower level bedroom has space for four guests to rest their heads for the night. Cozy up in front of the gas fireplace, perfect for those cold winter nights. Up in the loft, open to the living area below, is the master bedroom. There is also an attached bathroom and small TV. There is seating for 6 at the dining room table. A small balcony rounds out this living area. Beautiful cabinets and granite countertops make this an ideal kitchen for those wanting to prepare meals during your stay. The full sized stainless steel appliances include a dishwasher. Enjoy cooking in this cheerful kitchen. The balcony has seating and a gas grill, perfect for summer time cook outs. Grill may not function in colder months. Down in the lower level there`s a space for taking off boots and hanging your coats. There is a queen bed... ... and twin over twin bunk beds in the lower level bedroom. There is also a full bathroom in the lower level with a shower/tub combo. The large dual vanity is great for larger groups. Securely lock up your skis and snowboards in the ski locker. Caribou Highlands 542 is located at the Caribou Highlands resort and includes access to many amenities. You are just a short walk or drive away from Moguls restaurant and bar. There is a children`s playground just a short walk away. At the main part of the resort you will find many more community features- including another playground and BBQ grills. There is both an indoor and outdoor pool, with the indoor pool being available year round. Take a plunge in the heated indoor pool. There`s a small kiddie slide at the pool that is great for younger children. Soak in the hot tub after a long day of hiking or skiing. Or play a game of ping pong. 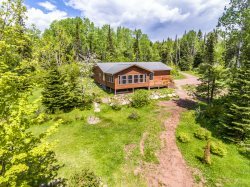 You'll love this home away from home on Lake Superior's North Shore! Caribou Highlands 542 is a 3-level ski-in/ski-out townhome located at the Caribou Highlands resort. The cozy townhome is the ideal getaway for a weekend ski trip or a summer time home base for your Northwood explorations. Caribou Highlands 542 has 2 bedrooms, 2 bathroom, and a cozy open living area. The kitchen has been remodeled with granite countertops and stainless steel appliances. You'll love curling up in front of the gas fireplace in the winter or grilling up a rack of BBQ ribs on the gas grill in the summer. Cap off a long day of skiing or exploring by dining at Moguls Grille & Tap Room, the resort restaurant and bar, or at Papa Charlie's Restaurant & Tavern at Eagle Ridge Resort right next door. Both feature live music from popular area musicians throughout the year and are easy walking distance to the condo. Just down the road, a short drive away, is the Lakeside Dining Room and the Poplar River Pub at Lutsen Resort, serving breakfast, lunch, and dinner (including a full breakfast buffet). Many other dining options are available along the shore. Or stay at home and enjoy a meal in your renovated kitchen or have a summertime BBQ using one of the community grills.